covering the basic mandatory subjects that need to be mastered before launching a high-precision measurement experiment based on frequency measurements. introducing and analysing chosen practical realisations (done or forecast) which exhibit the possibilities offered by a OFC and (or without) an optical link. 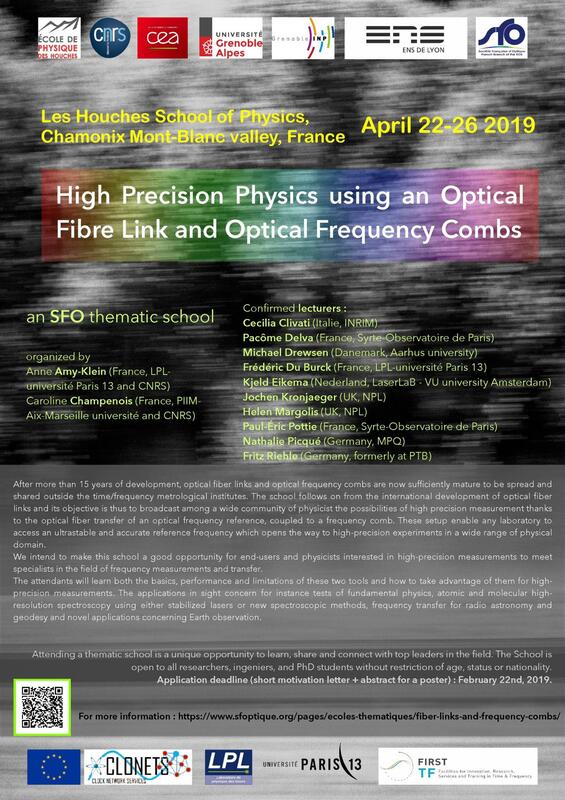 Physicists who are or will be connected with an optical fiber link to a metrological institute will find in this school many useful and dedicated informations to help them be prepared to the reference signal arrival. They can be members of the partner labs of the French network Refimeve+, which aims to disseminate an ultrastable and accurate optical frequency reference. They can also be concerned by a broader project through the European project CLONETS (CLOck NETwork Services: Strategy and innovation for clock services over optical-fibre networks), which aims at contributing to a stable and productive European network of time and frequency fibre links. More generally, this school will talk to the growing community involved in high-precision measurements all around the world, and to any physicists who would like to take a better advantage of optical frequency combs, relying or not, on an optical link. To foster exchange between the audience, two dedicated poster sessions are organized during the duration of the school and posters will remain on display, in order to encourage spontaneous discussions between participants. application form HERE - within the limit of available places ! Les Houches is a village located in Chamonix valley, in the French Alps. Established in 1951, the Physics School is situated at 1150 m above sea level in natural surroundings, with breathtaking views on the Mont-Blanc mountain range. Les Houches Physics School is funded by Université Grenoble Alpes, CNRS, Grenoble-INP, ENS Lyon, and CEA. Ecole de Physique des Houches, 149 Chemin de la Côte, F-74310 Les Houches, France.